Roasted chicken, poblanos, and goat cheese. All pizzas are made on a thin semolina crust, with light marinara sauce, mozzarella, pecorino & fresh herbs. This delicious pizza is a decent size and the crust was warm and crispy. There is plenty of roasted chicken and it is extremely tasty. 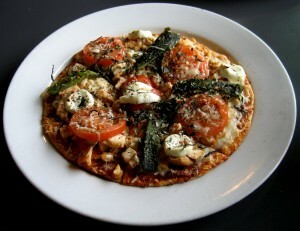 The goat cheese and adobo flavors really shine through, and the tomatoes and herbs taste fresh. After a few bites…our mouth was on fire! It was too spicy, and we had to remove the peppers that were placed on top of some slices. In fact, we were wondering if they substituted the usually mild poblano with a jalapeno instead! We will definitely order this and ask them to go easy on the peppers. With beurre blanc and a roll. Beurre blanc is a white butter sauce, and this one was fantastic! The chicken was tender and juicy, and was very addictive. 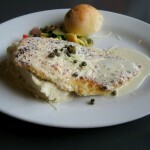 The capers provided a nice contrast to the overall rich, buttery flavor. The roll was nice, but not warm. The mashed potatoes were on the plain side, but still good. This was probably to let the chicken remain the center of attention. Also, the chicken was half resting on top of the mashed potatoes – so the presentation could be better. We would have preferred a salad or a large heaping of veggies. 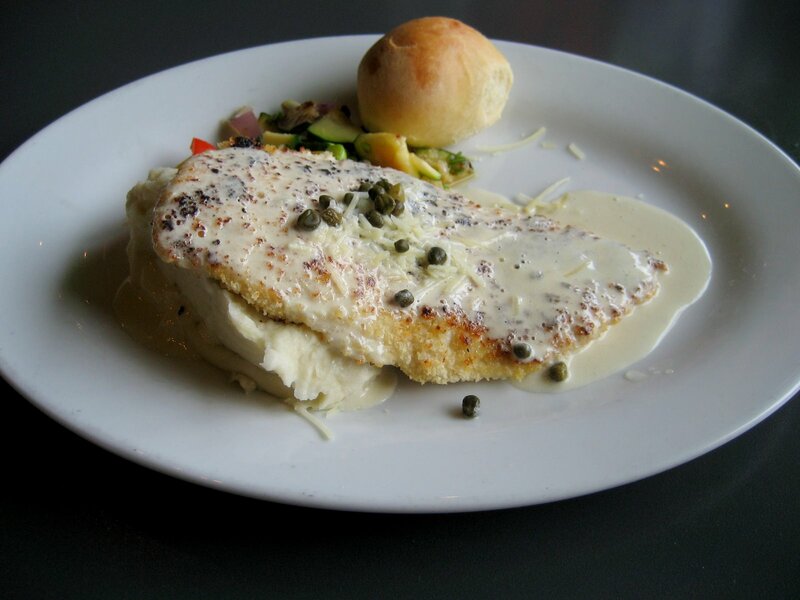 Regardless, this crusted chicken will leave you satisfied. We dined at 34th Street Café during a weekday lunch. The line to order food was only a few minutes long, and after we ordered with the cashier, we found a table and sat down. Only ten minutes later, our food was brought to our table. We were impressed because it was pretty crowded, but we did beat the lunch-time crowd by arriving at 11:30am. Everyone was friendly, from the cashiers, to the waiter who brought our food out, and especially the guy who kept refilling our ginger-peach teas. He remembered which one had ice and which one did not. The service here is great, and the wait-staff appear to be genuinely nice. 34th Street Café is located in a tiny strip mall and has a very unassuming exterior. Parking can be a problem because there are only a few spots in the front. Street parking might be available. The inside has a steel beam and wood-paneled ceiling, colorful walls, and unique art. It is a great place for a laidback lunch, and soft lighting and white tablecloths turn it into an ideal place for an upscale-casual dinner. This eatery is small but not crowded. The seating option consists of tables and chairs. It’s good for couples and smaller groups. 34th Street Café is the slightly sophisticated neighborhood joint that is great for an informal bite or a nice dinner. Check it out for yourself!